The last time we lived in this home we had chickens. Unfortunately we never got a single egg! Right as our chickens were about to start laying we were forced to look for employment elsewhere. We had to sell our girls chicken tractor and all. As soon as we decided to move back to our home, the Mister got the kids all riled up about ordering chicks again. I was the meany one voice of reason and wanted to hold off on ordering chicks until after we moved. I was completely outnumbered and we placed a chick order in March. March!! We weren’t even sure when we would be moving just that it would be sometime during the summer. Thankfully the chicks we really wanted were sold out until the very end of April, this bought me a little bit of time. The girls are all grown up now and they will begin laying in mid-September. We ended up with 14 hens. That is a lot of chickens for a family of 2 adults and 3 kids. Our children “own” the chickens and will be selling the eggs for their college funds. We “gifted” them with all the start up costs (coop, supplies, chicks, food) and we continue to pay for the food until the eggs start coming. Once the girls start laying the kids have to find customers and pay for their bedding, food, etc out of the money they make from selling eggs. In return they have to provide the family with as many eggs we need for each week. We already have several of my husband’s co-workers who have called dibs to be customers! I told him, half joking, that I wanted it to look like a little barn. I think he hit the nail on the head! I had fun picking out the perfect “barn red” paint color. 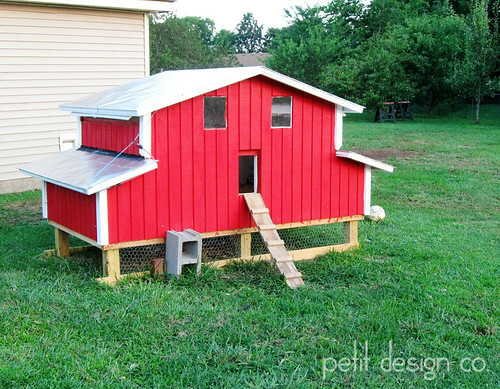 All it needs now are like faux shutters, a mini barn quilt, and some mini window boxes. If you live in the south you also know it rains a lot. 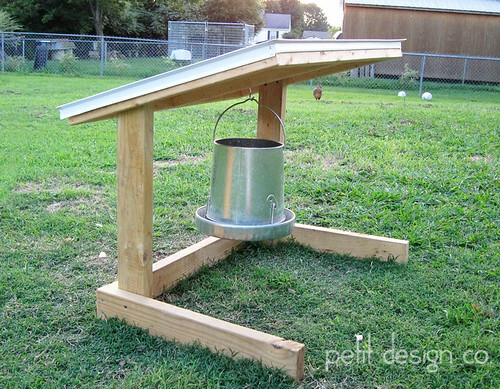 So the Mister whipped up this little covered feeder thingy to keep the rain out of the feed, and thus the flies down. Over all the girls love their new home. 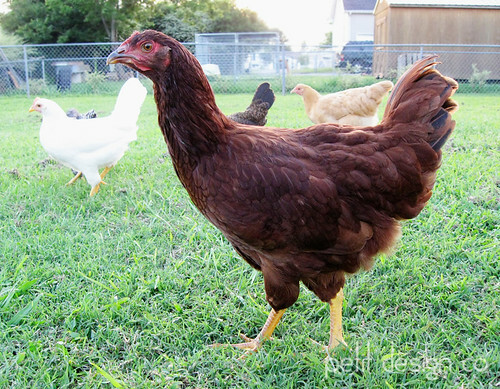 They especially like being able to roam the yard (at our last place we gave them a small temporary run that was attached to the coop.) Eventually we’ll move the coop to a more permanent location. This is just the spot where the two of us were able to dump it during a pretty good rain storm they day before moving day. Okay, so long story but I am interested in chickens for egg purposes. When I looked up the Araucanas it said that they are often confused with Easter Eggers. But the Araucanas have "tufts" on the faces. So -which do you have? Also are some breeds better layers than others?